Interview with Tore Lomsdalen first published in Volume 8 Spring 2016 of the Sophia Project News. Graduation 2013. 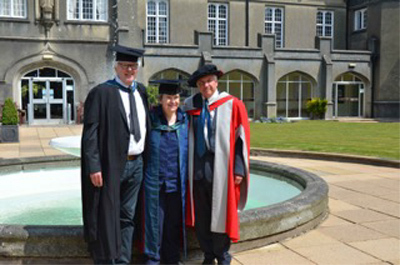 Tore and his two supervisors Bernadette Brady and Nicholas Campion. Photo: Patricia Korsgaard Orrell. Tore Lomsdalen began the Cultural Astronomy and Astrology MA programme in 2008 and graduated in 2013. His MA dissertation, Sky and Purpose in Prehistoric Malta: the Sun, Moon and the Stars the Temples of Mnajdra, was recently published by the Sophia Centre Press. Since then Heritage Malta have bought 300 copies which are now for sale at bookshops at all their archaeological sites. 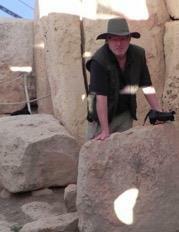 Tore also lectures on archaeoastronomy and cosmology at conferences and universities, and has recently been accepted to start a PhD in 'Cosmologies of Prehistoric Malta' at the University of Malta. Tore also runs a private astrology practice, en.astrolom.no, and writes articles and interviews for magazines and journals, and horoscopes for newspapers and websites. His interest in astrology began 20 years ago after he retired from a successful career in hotel management, although his fascination with the night sky began in his childhood in Norway, where the northern night sky offers luminous and clear views of astral phenomena. Tore talked to Kate White about the impact of the MA on his life and work. TL: I came across the MA when I was studying at the Faculty of Astrological Studies in London. I also attended the Sophia conferences in Bath, where I talked to Nick Campion about the programme. I didn't have an undergraduate degree - I'd done business administration and finance studies in Norway - but that proved not to be a problem. It's very good the MA is open to taking people without standard undergraduate degrees. My main reason I decided to do the MA was the history. I've always been fascinated with the history of astrology. TL: Obviously, archaeoastronomy! But all the modules were very interesting - the history of astrology was a favourite. The archaeoastronomy module brought me into something new, and Kim Malville and Nick Campion inspired me to do the fieldwork. I am more hands-on rather than being academic and into books, so I wanted a practical application for my studies. TL: I became a better astrologer. It widened my point of view to include the historical, cultural, and cosmological. Although the MA doesn't teach the practice of astrology, it gives it depth and substance. It's also taking cultural cosmology to a higher level through academic education. TL: The archaeoastronomical alignments of the temples of Mnajdra in Malta. I wanted to know if the alignments were intentional, and found they were intentionally built to receive illumination at the solstices and the equinox. My theories are based on statistical and empirical evidence, as the temples date to the Early Neolithic through the Early Bronze Age (4100-2500 BCE) and thus there are no written records - the structures predate Stonehenge and the Pyramids by 1000 years. The majority of the temples in Malta are aligned to the winter solstice, and at Mnajdra, the alignments are very precise. This is what I find fascinating about prehistory: without written language, you have to dig in and find evidence. TL: Quite a lot, but Nick did say that my life would never be the same after finishing the MA! I've been invited to talk at conferences, both astrological and academic, at various universities. I joined SEAC (the European Society for Astronomy in Culture) and then organized the 2014 SEAC conference in Malta in collaboration with University of Malta. I've also had my dissertation published as a monograph by the Sophia Centre Press, which is now being sold in bookshops on Malta, and contributed articles to edited books. It's also been amazing to be able to put on my CV and website that I have an MA in this subject. On a purely business level, for people looking for an astrological reading, it gives them confidence. TL: The Early Mediterranean Village: Agency, Material Culture, and Social Change in Neolithic Italy by John Robb. It doesn't cover Malta specifically, but in Neolithic times Malta was closely connected to Italy and Sicily. I'm also reading An Ethnography of the Neolithic: Early Prehistoric Societies in Southern Scandinavia by Christopher Tilley, which is helping me put Neolithic Malta into a larger context. TL: The big thing is the PhD. It took me some time to decide if I wanted to do this. Eventually, due to my strong interest in prehistoric Malta and its cosmologies, I decided to proceed. Nick Campion, Bernadette Brady, and Fabio Silva were all inspiring me to do a PhD, and Fabio is actually one of my supervisors. I like the idea of bringing in new knowledge; no one has put the cosmologies into a holistic view - most archaeology studies don't include the sky. For ancient people, half their world was the sky; earth and sky were integrated in their lives. Many thanks for taking the time to do this interview, Tore. We wish you all the best with your PhD studies and look forward to hearing how it evolves in the future. A decade after graduating, Wendy talked to Kate White about the impact of the MA on her life and work. 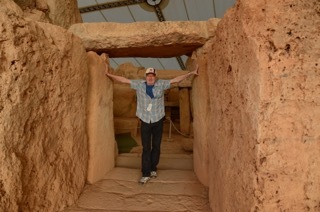 Tore at the Entrance to the Mnajdra South Temple. Photo: Clive Cortis. 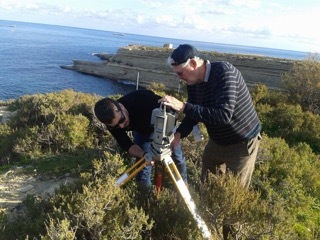 Fabio Silva and Tore preparing for alignment measurements at a Maltese temple site. Photo Grace Cassar.